One aspect of my former life that is now missing is crafting. I used to be a fiber artist. There is something very meditative and calming about spinning wool or weaving. Unfortunately, the busyness of motherhood has pushed this aside, and every summer I pledge to bring it back, as well as include my children in the process. In this wired, wild world, it is harder than ever to shut out noise and busyness in order to truly calm yourself, but in Crafting Calm, a D.I.Y. guide to peace of mind, you’ll find inspiring ideas for how to do exactly that through a wide range of creative exercises. 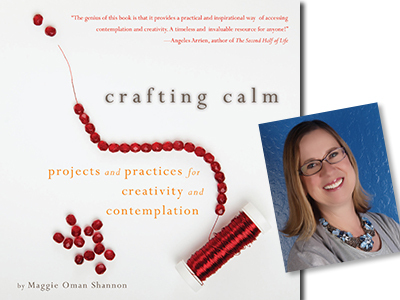 In this book, author Maggie Oman Shannon explores crafts and creativity as a practice with enormous physical, mental, and spiritual benefits. By immersing ourselves in a craft with intention and mindfulness, we can quiet those voices around us and in us—we can enter sacred stillness. Through revealing interviews, personal stories, and forty suggested activities, the author shows how creative processes can become spiritual practices. Whether you’re an aspiring artist, longtime craftsperson, or someone who has never set foot in a craft-store (yet! ), you’ll find something inCrafting Calm to inspire you. Crafts and how-to ideas include contemplation candles, visual journals, prayer shawls, collage mandalas, intention beads, finger labyrinths, personal prayer flags, spiritual toolkits, and tabletop altars. Many of these projects would be perfect for the classroom or homeschool too! For example, I plan to make talking sticks and collage mandalas with my class. These projects are part of a great chapter called “Crafting for Community” including communal projects. I also like the idea of making personal prayer flags with kids. Does Bottle-Feeding Cause Postpartum Depression?